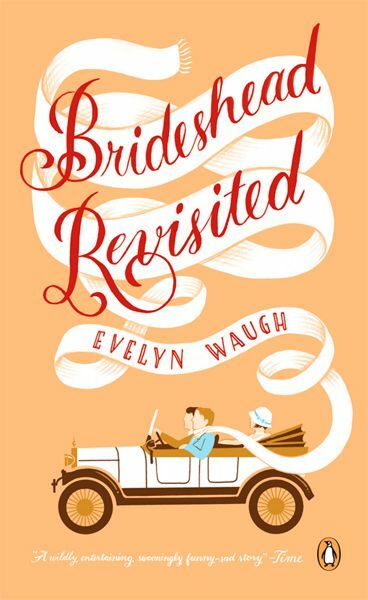 The current challenge at The Library is 'Brideshead Revisited' and you can take inspiration from the cover or the title or the story. I took inspiration from the cover and the way that the scarf comes out and has writing on it. 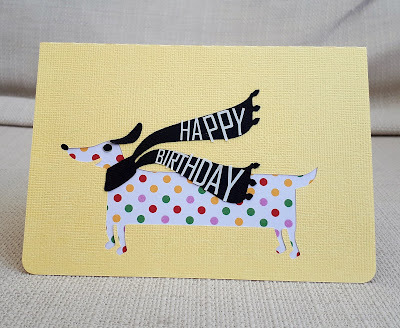 I had this dog as a free Lettering Delights electronic cutting file - it was originally a folding card but I modified it and cut it as an aperture in a card base. I enlarged the scarf and designed the letters to fit into it. I'd really love to see a few more entries into the challenge at The Library. Please do come over and join in. Oh, I adore your polkadot pooch!! Fab design! So sweet, loving our spotty dog and a really pretty Birthday card, thank you so much for joining in our 9th Birthday celebrations at Allsorts challenge. Love your card! At first I thought that it was a stamp that you paper pieced. That is brilliant with the scarf! 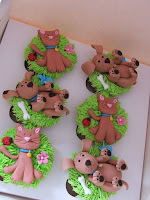 Thank you for joining Cut it Up Challenge - Cat or Dog! This shows that the use of DP and CAS style can be combined. I think your little happy doggie is utterly cute. What a fun card! I love the way you interpreted the inspiration book.